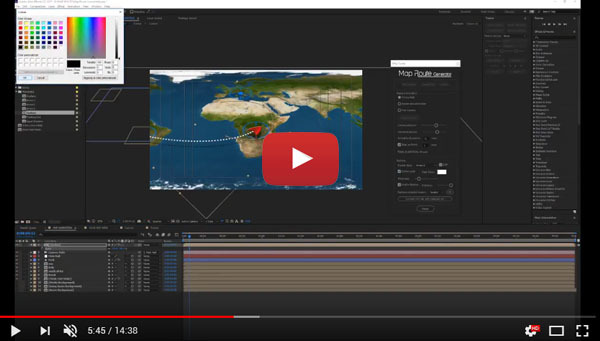 Map Route Generator is a template based on an After Effects project controlled by the included script. The great advantage of Map Route Generator is that you can create your route in a few minutes, without loosing time moving keyframes or markers. The workflow is very easy: Import your map, use the script to add your locator and place them in the correct position, select all locators and press the “create path” button! Basically, the script allows you to control the entire animation: using it, you can set the duration of the animation, decide if you want to stop on a point and set for how long, to leave enough time to read the location description. Furthermore you don’t need to move the camera manually to set its animation, because the script performs this task automatically! Follow path: the camera follows the path creation, keeping the altitude and the distance that you set with the slider controls. Rotate around tracker: this is similar to the follow path, but the camera also rotates around the tracker. Free Camera: in this case the script algorithm calculates the position of your points and creates a free camera movement; if you don’t like the generated camera movement, don’t worry: just press the “Random seed” button and the script will calculate a new camera animation! add or remove the shadow below the path and tracker and set the shadow distance from the ground, replace the locator points with pins and connect your info tabs or call-outs directly on your placed points. If you want to use your custom pin or custom tracker, you just have to import them into the project, then select them from the script. All available pins, trackers and info tabs are fully customizable; it means that each element has an own color control panel where you can change all colors. 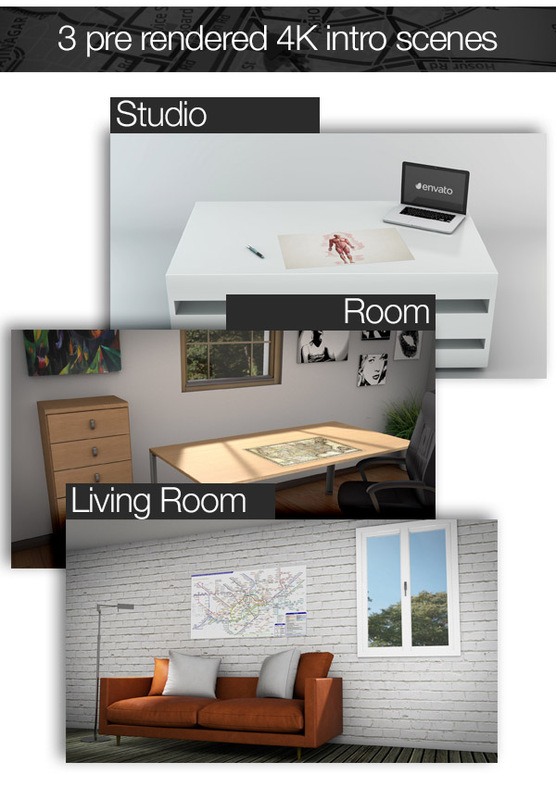 The project also includes 3 pre-rendered 4K intro scenes that you can use to introduce your map animation. Just choose your intro scene and add it to the render queue. This project allows the creation of a map animation with a maximum duration of 5 minutes.